Property Size 1,060 sq. ft.
Maravilla is one of the most popular family complexes in Miramar Beach/Destin area. It offers 2.5 acres of beaches along with it own private beach access.PET FRIENDLY unit. The community clubhouse is great for large gatherings with a well equipped kitchen and sitting area with a large 48" flat screen tv. It has 2 large pools one that is heated seasonally, tennis courts, workout room and basketball courts. You can utilize the large walking paths for a nice stroll or jog along Scenic Gulf Drive. Our unit sleeps 8 comfortably with 1 king in master, 1 king in loft, a queen room and 1 queen sleeper sofa. It has 2 bathrooms one off of the master and one attached to the loft. This unit would be great for multiple families or a large family. It has a nice open floor plan and a lovely balcony off the living room. 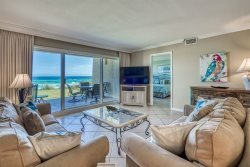 This unit is a great place to relax and enjoy a "Beach Escape"! Add $130 for housekeeping and 11% for tax. $69 damage protection; 2.5% to process credit card payments. 25% of the total is due at booking and will hold the unit for you. The remaining balance is due 30 days prior to your arrival.